For young and upcoming researchers, joining an international event is always a welcome opportunity. 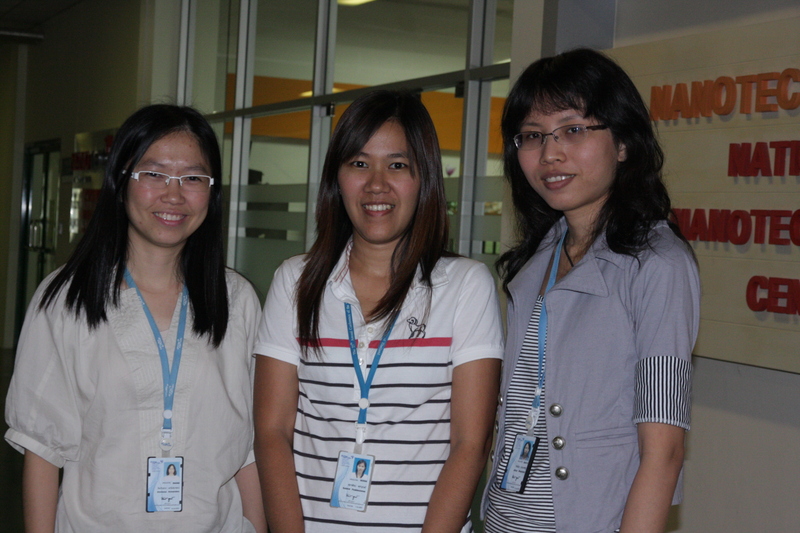 For Ms. Jittima MEEPRASERT (Mam) – Assistant researcher, Nanoscale Simulation Lab, NANOTEC, Ms. Sudarat POOKBOONMEE (Liew) – Assistant researcher, Hybrid Nanostructure Lab, NANOTEC, Dr. Weerakanya MANEEPRAKORN (Pui) – Research, Nano-Molecular Target Lab, NANOTEC, and Mr. Ong-arj TANGMETTAJITTAKUL- PhD candidate, Chulalongkorn University, this opportunity came when they were chosen to represent Thailand in the Asia Nano Camp 2010 (ANC2010) which was held from Oct 3 – 15 in Singapore and Malaysia. This is the first time the camp is co-hosted by two nations. Over 40 researchers from 13 countries participated in ANC2010. “Unlike research collaborations that are implemented between research labs where the main focus is on the research project, ANC approach is to first build personal relationships between researchers” said Dr. Weerakanya. “Personally, I think this is the key element which helps to make ANC a success. In addition, I was astonished to see the level of research projects that is being undertaken by countries in the region. I think we often overlooked our neighboring countries when we explore research collaboration overseas”. ANC activities allowed participants to discuss and form collaborations on nanotechnology, and also experience the cultures of their host nations. Participants presented their research on nanostructured materials and devices, as well as discussed the impact of nanoscience and nanotechnology on society. A substantial part of the program involved participants to discover more about their host nations from research, economically, and culturally aspects. The participants visited Singapore universities, research organizations and local companies which employ nanotechnology research such as Hyflux. They also participated in cultural immersion program which introduced them to the sights, sounds, diversity, and tastes of Singapore. In Malaysia, the participants also got an opportunity to meet with the Minister of Science and Technology. In addition, they visited several research institutions and science parks. “Being able to adapt to working in international setting is something that will stand out for me when I look back at ANC2010” said Sudarat. “I was very impressed with the visit to Kulim Hi-Tech Park in Malaysia. The park had everything from hotels to hospitals to research facilities by both private and public sector. The research projects that we saw were very advanced”. “Just being able to participate is a positive experience for me” said Jittima. “The knowledge gain from interacting with other researchers from various countries helps to broaden our understanding”. The annual camp was initiated in Japan two years ago by the Asia Nano Forum (ANF) network, an organization spanning 15 countries in the Asia-Pacific region, which was founded in 2004 to promote excellence in research, development and the economic uptake of nanotechnology within the Asian region. ANC 2011 will be held in Korea. NANOTEC International Relations Section will announce registration once it is available.